When it comes to doing business online, it’s important to understand who you are doing business with. Face-to-face, you can rely on physical identification. But in remote situations, you can’t typically fall back on these tried and true ways of authenticating signers. This is where understanding risks comes into play. There may be some transactions that present little risk to an organization and others where the stakes are higher, depending on the value of a contract or the type of information being agreed to. At SIGNiX, we know that not all of your documents come with the same amount of risk, which is why we offer a variety of ways to prove your signers’ identities. 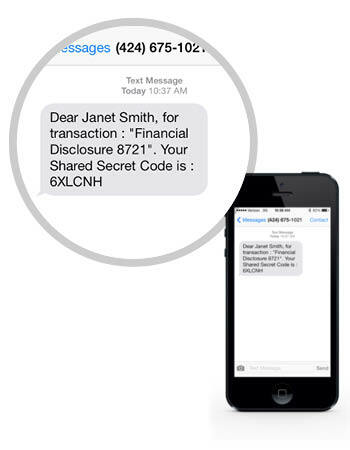 In fact, our customers can assign different authentication methods to each party in the same transaction. Electronic signatures are just as legally binding as handwritten signatures, but that doesn’t mean that all electronic signature products are on an equal footing if a signature is challenged in court. When someone claims “I didn’t sign that,” you need to know that your e-signature vendor has your back. 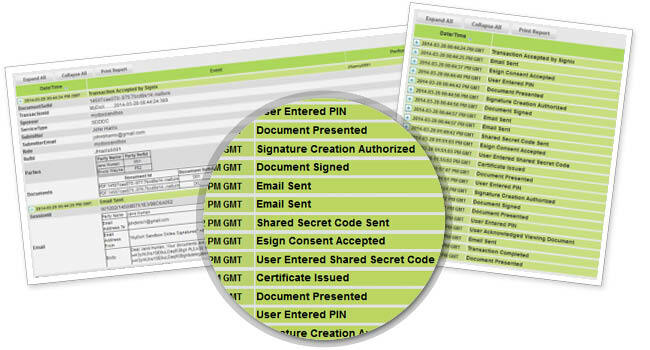 With SIGNiX, every step in the document's lifecycle is tracked and delivered to you in a highly detailed log we call TotalAudit—a powerful tool that can prove who signed a document and when they signed it. This log gives you the best legal evidence if your documents are ever challenged in court or by a regulatory agency. 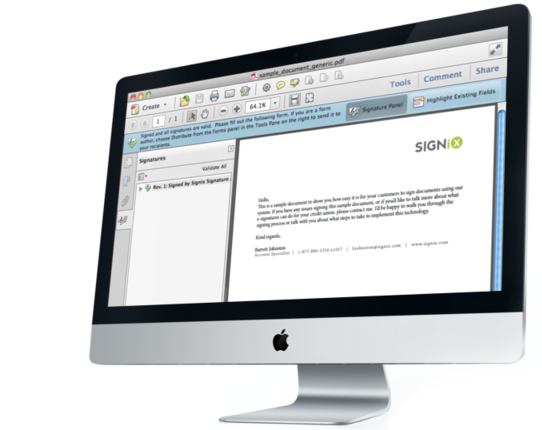 SIGNiX-signed documents can be easily verified using free PDF reader software. There’s no need for you to be online. All you have to do is hover over a signature to find out if the signature is valid. To see more information, simply click on the signature to open the Signature Properties dialog box. 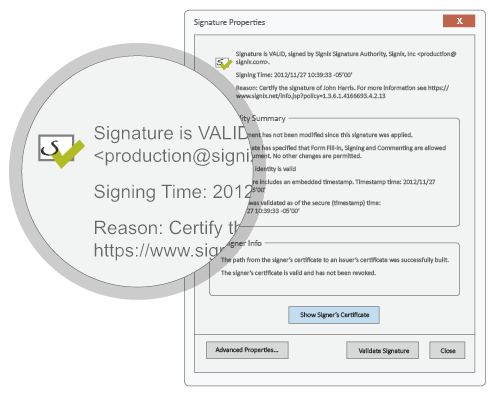 This dialog box contains a rich set of information about the signature: the name of the signer, a timestamp of the signature, the nature of the document when it was signed and other technical details. This is a quick and easy way to know if your documents have been tampered with. When you used to sign with a pen, you never had to worry about keeping that pen around just to verify your signatures took place. We don't think you should have to do that with your signature vendor in the digital world either. All digital signatures and their validation information are embedded into the document and aren’t inherently tied to the SIGNiX website. SIGNiX uses fundamentally different signature technology that's based on standards known the world over, meaning you don't need SIGNiX around just to understand the signatures on your documents. Moreover, many firms prefer to store confidential client documents on their own servers, and SIGNiX’s exclusive Flex StorageTM technology gives you this option since the necessary legal evidence is embedded in every document. With Flex Storage, you can decide whether you want to store documents on our highly secure servers or within your own secured document management systems.